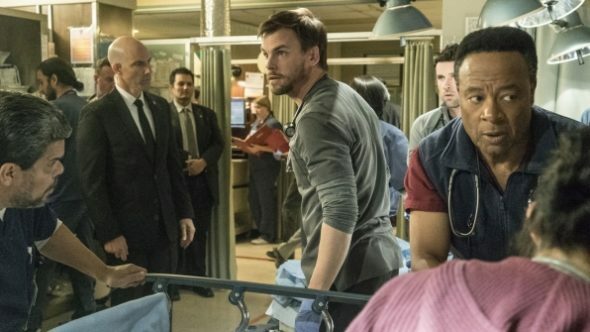 Code Black TV show image courtesy CBS. Does ‘code green’ mean go? The Code Black TV show on CBS has been renewed for a second season. The news broke as part of the CBS May Upfront presentation. This news was expected, as with fellow freshman series, Criminal Minds: Beyond Borders, Code Black was given network permission to secure the writing staff in what’s called and “if/come” deal. The Code Black TV series cast includes: Marcia Gay Harden, Raza Jaffrey, Bonnie Somerville, Melanie Chandra, William Allen Young, Harry Ford, Benjamin Hollingsworth, and Luis Guzman. Medical drama Code Black, from creator/exec producer Michael Seitzman, had been gaining momentum the past couple of weeks. It is expected to undergo some changes for Season 2, with new characters added. It has been a consistent ratings performer, never falling under 1.1 ratings among adults 18-49 in Live+same day. CBS has also renewed Criminal Minds: Beyond Borders, Undercover Boss, and The Odd Couple. Check out our coverage, today. What do you think? Are you a fan of the Code Black TV show? Do you plan to watch the second season? Best need show on TV… IS THERE GOING TO BE A SEASON THREE? GREAT SHOW! Great to hear this series has been renewed. We love this show! We really enjoy Code Black! Best med show on air!! Wonderful to see it’s been renewed!